As one of the approximately 20 per cent of university presidents in Canada who are female, I know what it feels like to aspire to a position for which there are few role models. I have been fortunate throughout my career to have family, colleagues and mentors who have supported me in such a way that I have never questioned if I would be limited because of my gender. However, this isn’t the case for many women and girls. That’s why, on International Day of the Girl (October 11), we must stand up and speak out for girls and young women. We need to challenge the idea that it’s normal for women to be in the minority in positions of power. We need to inspire young women and girls to ‘defy normal’ and have no reservations about aspiring to certain university programs, for seats in boardrooms and the House of Commons, for places in research laboratories, to be on a judicial bench, or to run a company. At Laurier, we are proud to partner with Plan International Canada as they celebrate International Day of the Girl. On this day, young women go out into the workforce to take on roles in which women are traditionally under-represented. They will occupy seats of power across the country, sending a clear message that we take seriously their ambitions, intelligence and skills. This is an opportunity to advocate for action in gender equity and reflect on what we can do to address the persistent gaps. Barriers include internalized biases people have about the roles women should occupy in the workplace and a lack of mentors for young women looking to occupy leadership roles. While there have been significant advances in gender equity, women continue to be in the minority in leadership roles. Among my own colleagues of university presidents in Canada, approximately 20 per cent are women – a number that has not really budged in decades. In boardrooms of FP500 companies, the numbers are similar, with only 22 per cent of seats occupied by females. Last year, for International Day of the Girl, I was fortunate to host 17-year-old high school student Muneeza, who took over my role as Laurier’s president for the day. This was an exceptional experience, as I was able to hear Muneeza’s ambitions of going to university and becoming a surgeon. In return, I was able to share with Muneeza the experiences I have had as a biologist, faculty member, and university president. This year, Laurier has strengthened our partnership with Plan International Canada to further advocate for girls’ empowerment and leadership. 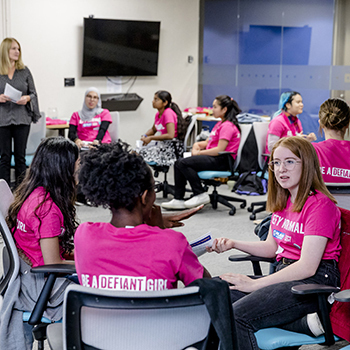 In September, Laurier career development centre consultant Susan Malcolm led a ‘business 101’ session for this year’s ambassadors, to prepare the young women to fill leadership roles on October 11. Susan has done an excellent job preparing the ambassadors and I am confident their experiences from this day will contribute to their future successes. On October 22, the young women will again participate in a session with Laurier that will include a debrief of their days as leaders in positions across Canada, as well as tips on networking and résumé building. At this session, hosted at Laurier’s Toronto Office, I will meet with the participants to share my own leadership experiences. Events like these are critical for young women. It is critical for them to see that if they follow their interests and passions, there will be mentors along the way who will offer encouragement, advice and support when they need it. We need to sustain the momentum we build from International Day of the Girl. On this day and in the days to come, I encourage you to find ways to support the young women and men in your life to realize their full potential.